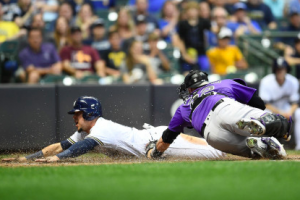 Two of the hottest teams in baseball at the end of the regular season will meet one another in the NLDS as the Milwaukee Brewers face the Colorado Rockies. Including Monday’s win over the Cubs to clinch the NL Central, the Brewers enter the postseason with an eight-game winning streak. Meanwhile, the Rockies won nine of their last 12 games before taking out the Cubs in Tuesday’s Wild Card Game. In short, neither team will be lacking for confidence when this series gets underway on Thursday. Both of these teams were among the top-3 in the National League in runs scored this year. However, the Brewers get the slight edge because they are a little deeper and didn’t have the benefit of playing half of their games at Coors Field. Milwaukee will have veteran hitters like Eric Thames and Curtis Granderson coming off their bench, which tells you everything you need to know about their lineup, which includes MVP-elect Christian Yelich, as well as Lorenzo Cain, Travis Shaw, Mike Moustakas, and Jesus Aguilar. Of course, the Rockies can score runs too, both home and away. The trio of Nolan Arenado, Trevor Story, and Charlie Blackmon is as potent as any in baseball. David Dahl shouldn’t be overlooked either with the way he came on strong the second half of the season. Colorado also features a platoon situation between Carlos Gonzalez and Matt Holliday, two veteran players that boast plenty of playoff experience and could prove valuable to the Rockies during this series. Neither team is particularly impressive in this area, although the Rockies will get a slight edge with a caveat. With German Marquez starting against the Dodgers on Monday and Kyle Freeland going on short rest against the Cubs on Tuesday, neither will be available until the end of the NLDS. That means the Rockies will only get one start each out of their two best pitchers. If the Rockies can push the series to four or five games, they’ll have a huge edge with Marquez and Freeland on the mound. However, they’ll need Antonio Senzatela, Tyler Anderson, and Jon Gray to get them there. The Brewers, meanwhile, don’t have much confidence in most of their starters. However, they’ll have a chance to take an early series lead with Wade Miley and Gio Gonzalez pitching the first two games. Miley has been a revelation, posting a 2.57 ERA in 16 starts after sitting most of the first half with an injury. Gonzalez has also excelled since being acquired in late August. He’s 3-0 with a 2.13 ERA in five starts with the Brewers. Presumably, Jhoulys Chacin will make it back for Game 3, but beyond that, the Brewers don’t appear that eager to send Zach Davies or Junior Guerra to the mound in a playoff game. The bullpen is where the Brewers have an edge over almost any other team in the postseason. The closer spot has been in flux this season, but the Brewers seemed to have settled on Jeremy Jeffress for that role. They also have Josh Hader, who’s been electric this season, and former closer Corey Knebel in setup roles. Milwaukee’s bullpen also has impressive depth with Joakim Soria and Dan Jennings, as well as Guerra and Freddy Peralta also being options in relief. However, the Colorado bullpen shouldn’t be overlooked, especially after they outlasted the Cubs in the 13-inning Wild Card Game. Despite an elevated ERA this season, Wade Davis remains a top-notch closer. Adam Ottavino had a standout season and will be a go-to guy late in games. Scott Oberg, Harrison Musgrave, and Seunghwan Oh also give the Rockies some options, even if their bullpen isn’t as deep as the Milwaukee bullpen. Both of these teams can score runs, which could make this a high-scoring series. However, late in games, the Milwaukee bullpen is far more likely to hold a lead. That will end up being the difference in what should be a close series. Milwaukee wins in five games.